•Drink more fluids (nonalcoholic), regardless of your activity level. Don't wait until you're thirsty to drink. Warning: If your doctor generally limits the amount of fluid you drink or has you on water pills, ask him how much you should drink while the weather is hot. •Don't drink liquids that contain alcohol or large amounts of sugar–these actually cause you to lose more body fluid. Also, avoid very cold drinks, because they can cause stomach cramps. •Stay indoors and, if at all possible, stay in an air-conditioned place. If your home does not have air conditioning, go to the shopping mall or public library–even a few hours spent in air conditioning can help your body stay cooler when you go back into the heat. 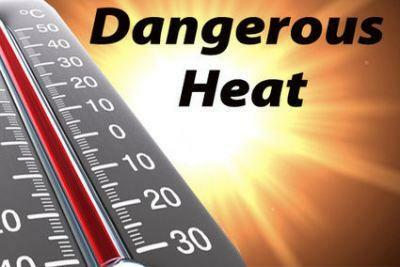 Call your local health department to see if there are any heat-relief shelters in your area. •Cut down on exercise. If you must exercise, drink two to four glasses of cool, nonalcoholic fluids each hour. A sports beverage can replace the salt and minerals you lose in sweat. Warning: If you are on a low-salt diet, talk with your doctor before drinking a sports beverage. Remember the warning in the first "tip" (above), too. •Protect yourself from the sun by wearing a wide-brimmed hat (also keeps you cooler) and sunglasses and by putting on sunscreen of SPF 15 or higher (the most effective products say "broad spectrum" or "UVA/UVB protection" on their labels).